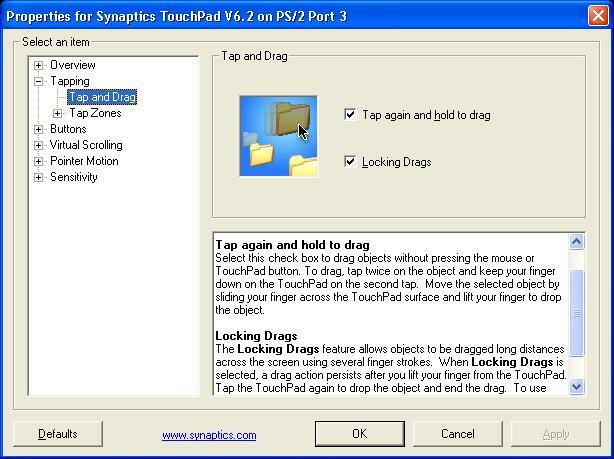 Can anyone advise of a USB touchpad or touchpad/keyboard combo that has an option of "locking drags" initiated by "double tap and hold" and released by a single tap, like it is possible on laptops with Synaptics touchpads and Macs? I have just purchased an Adesso AKB-430UG keyboard/touchpad combo with a built-in what I believe is called GlideExtend feature that requires keeping the finger on till it hits the edge of the pad in order to initiate a lock and find it extermely uncomfortable. Once installed this feature should be turned on by default, or you can activate it in the control panel of the driver on the "Tapping" tab. Sorry for the confusion, our driver should support this feature also, but its located in a different section of the control panel, under the "Motion" tab. Try activating the feature called "DragLock" and let me know if that provides the functionality you are looking for. That seems exactly what I need, with the drag lock released on demand by a single tap (when reading Help); however, when I installed the driver after selecting a USB option, I get "no GlidePoint devices attached" when running the Control Center. 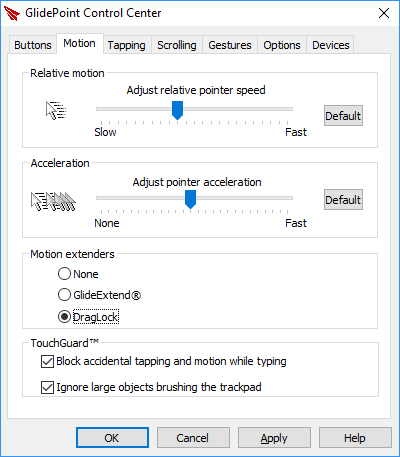 "For optional advanced features of your touchpad, such as Horizontal Scrolling, Zoom In/Out, and Back, Forward functions, please download the driver from our drivers section: http://www.adesso.com/drivers/GlidePoint.zip"
However, the link doesn't work, Adesso support emailed me that the keyboard is plug-and-play and didn't need a driver (in spite of what their own manual says - they are absolutely useless), and I needed to hold the left button if I wished to drag (it's just unbelievable). The touchpad does appear to be made by you, as it has a built-in function exactly similar to GlideExtend (which Adesso support don't seem to be aware of, though it is not for me, as it needs holding the finger on, till it's scraping the edge, and lasts for 3 seconds - I don't find it comfortable), as well as vertical scrolling, and the driver named exactly as GlidePoint is cited in the manual (seemingly not known to the useless Adesso support either). Sorry to hear that you are having trouble with the driver. I have passed this along to our engineering team, and they will be getting in touch with you via email. We have already "resolved" this issue over email, but I want to post the summary here for the benefit of other forum visitors who are looking for answers to similar problems. Unfortunately, this particular Adesso keyboard will not let its built-in touchpad work with the Cirque driver. Inside the keyboard, the touchpad is connected to the keyboard microcontroller, which presents the touchpad to the computer as a standard mouse. The touchpad converts finger and button input into mouse data and sends it to the keyboard microcontroller to be forwarded to the computer. 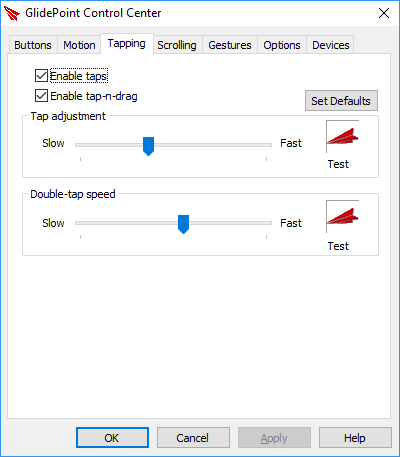 GlideExtend is the default behavior used by the touchpad firmware. In order to change that behavior, the Cirque driver needs to be able to send commands to the touchpad firmware and receive responses beyond the regular mouse data. The keyboard microcontroller does not support that. In the past, Adesso has manufactured keyboard/touchpad combos that do support the Cirque proprietary communication protocol and can therefore work with the Cirque driver. You may want to contact Adesso to find out what those are.